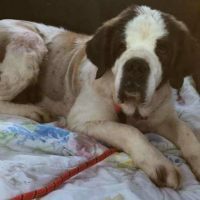 When 10-year-old Old Lady, a Saint Bernard pup, went missing after wandering off in Minnesota. After 17 days, Azure Davis, the founder of rescue organization Ruff Start Rescue, was losing hope fast. Temperatures were freezing and the pup didn’t have a thick enough coat to survive. 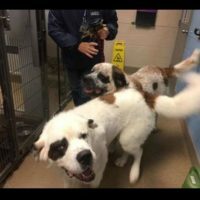 Weighing in at a total of over 300 pounds collectively, these three Saint Bernards made quite the impression when they arrived at a shelter located in Edmonton, Canada. An abandoned house in Detroit has been a sad location for years. 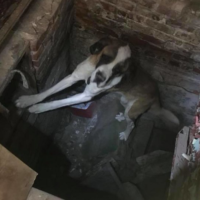 It’s a common dumping site for irresponsible pet owners and breeders, and the community often steps up to rescue the abandoned pup every time new barking noises are heard from within. 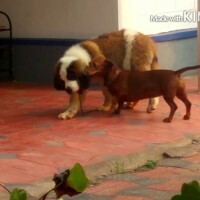 Adorable Dachshund Decides She’s The Boss Of Her Saint Bernard Sibling! Meet Dona an adorable dachshund pup who’s spending quality time with her Saint Bernard sibling Bella and the two are literally inseparable! Take a look at this!